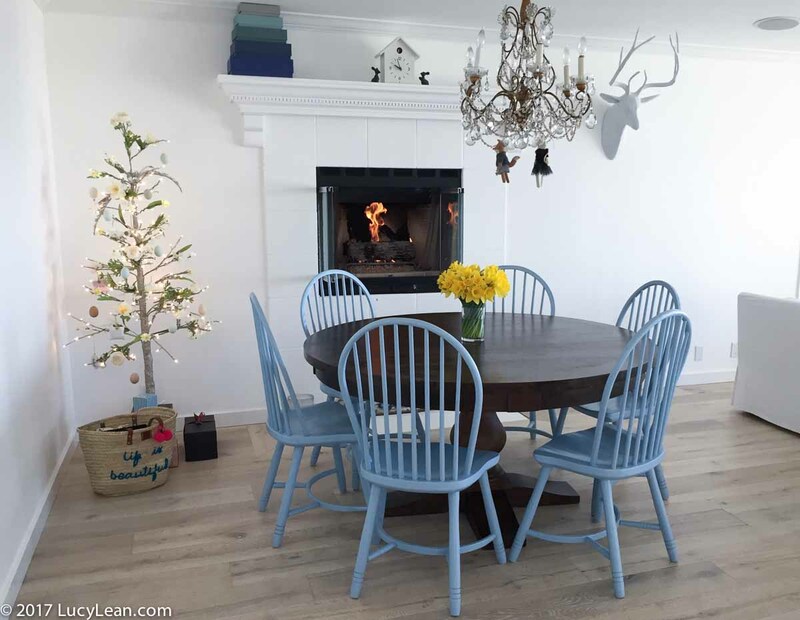 Why not keep the Christmas Tree Up All Year? 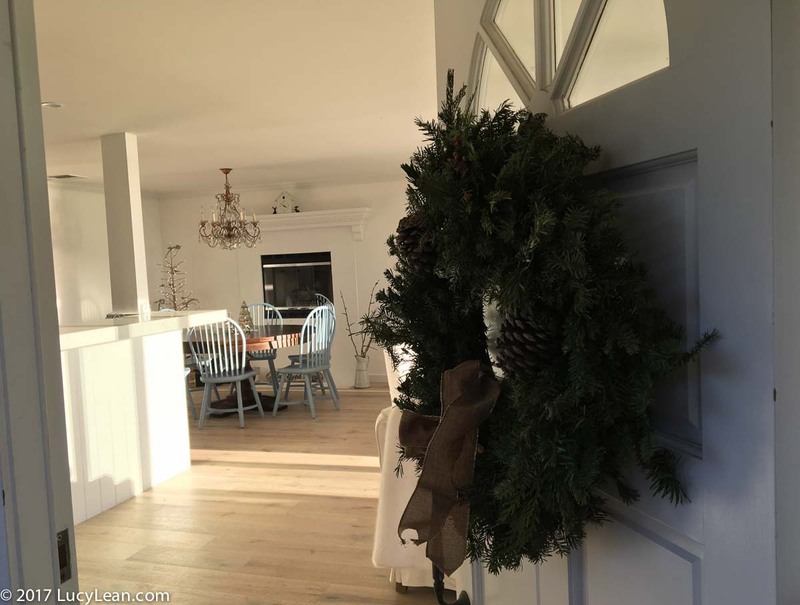 This year I am trying something new at the Beach House – A christmas tree all year. 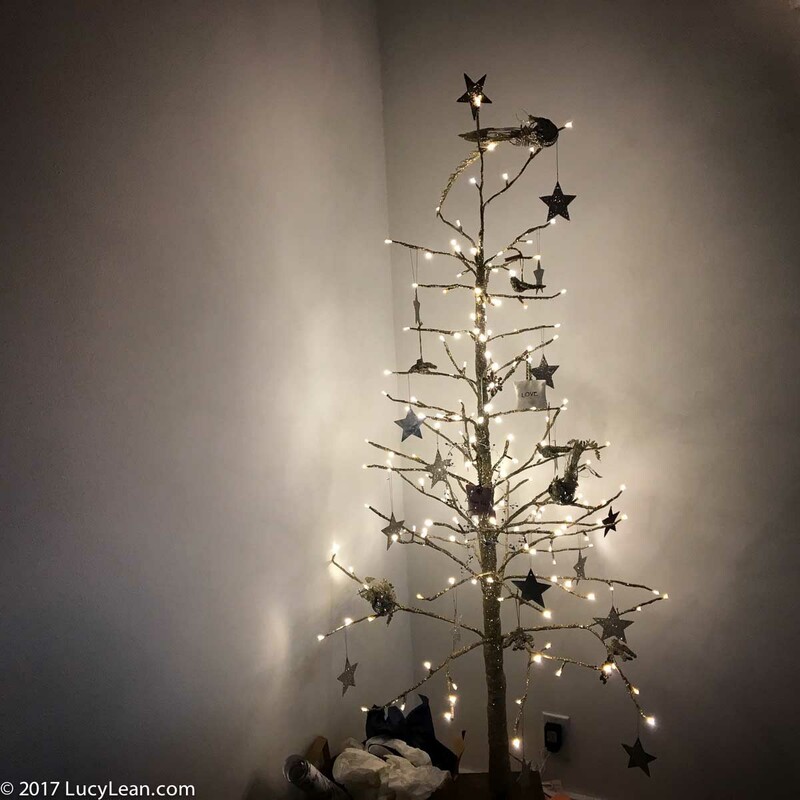 I have a pretty little sparkly tree that I bought to decorate the house last Christmas, I was finally able to buy a fake tree – the kids insist on a real tree saying I ruined their childhood dreams with the fake white stick tree when they were babies. Initially the little tree was bare and the presents beneath were enough of a decoration. But after Christmas I wanted to add to the tree for New Year’s Eve. I got my glitter on and covered zinc stars with German glass glitter and kept it very minimal – just the stars with a few birds to ring in 2017 – the year we are all going to reach for the stars. When it came to take it down on January 6th I couldn’t bring myself to do it. I couldn’t live without it. I loved the perfect warm glow of light in the corner of the room at night. 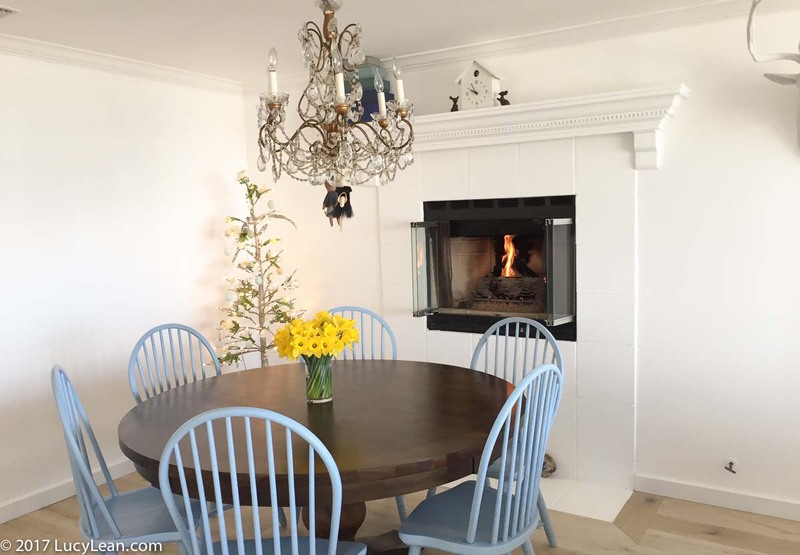 I loved that it was an instant whimsical addition to the room when I plugged it in upon arrival in Malibu. I loved that it didn’t shed, well maybe a little glitter, and it was far too soon to hide it away until next Christmas. So I decided to keep it up all year and decorate it for whatever holiday was next. January into February was all about love with Valentine’s Day, Remy’s and Didier’s Birthdays. I decorated the tree with red velvet love hearts embroidered with gold thread and seed beads from Lavender Blue. I found a garland of paper hearts that I wound around in a spiral from top to bottom. There were sequin love birds at the top kissing, a love letter and a ship in a bottle. The great union flag heart ornaments from Claudia obviously made the cut, as did the crests of the Lion and the Unicorn from Liberty of London. Yes my tree, just like a dog, was going to be for life and not just for Christmas. 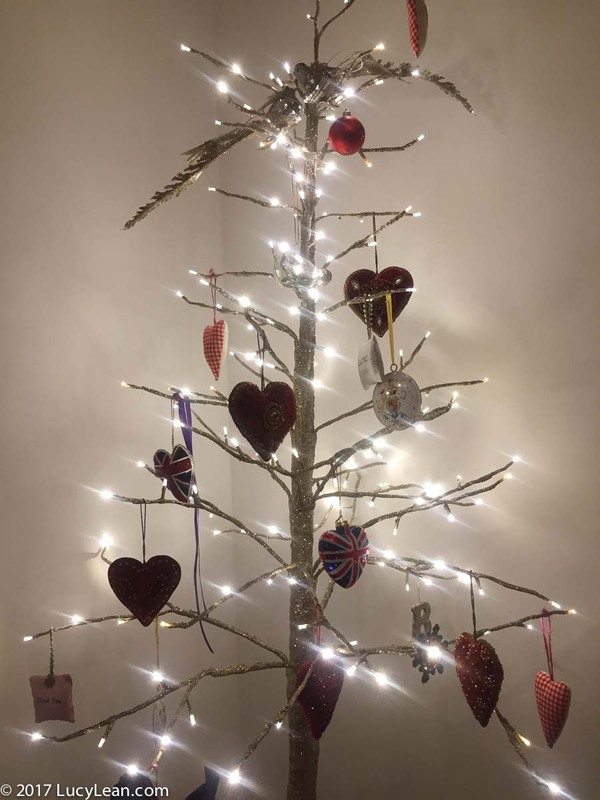 We needed all the love we could find with the politically rocky start to this year so I was extra happy to have the comfort of my little tree all covered in red hearts. 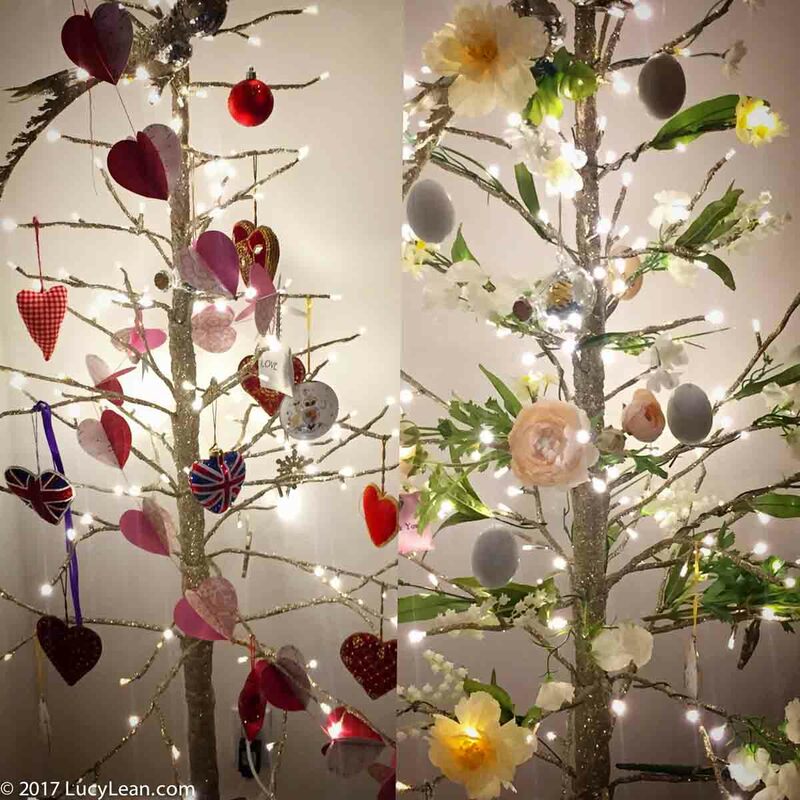 Just like at Christmas I was loathed to part with the Valentine’s tree – I mean, how was I to top all those luxurious hearts and such an expression of love? 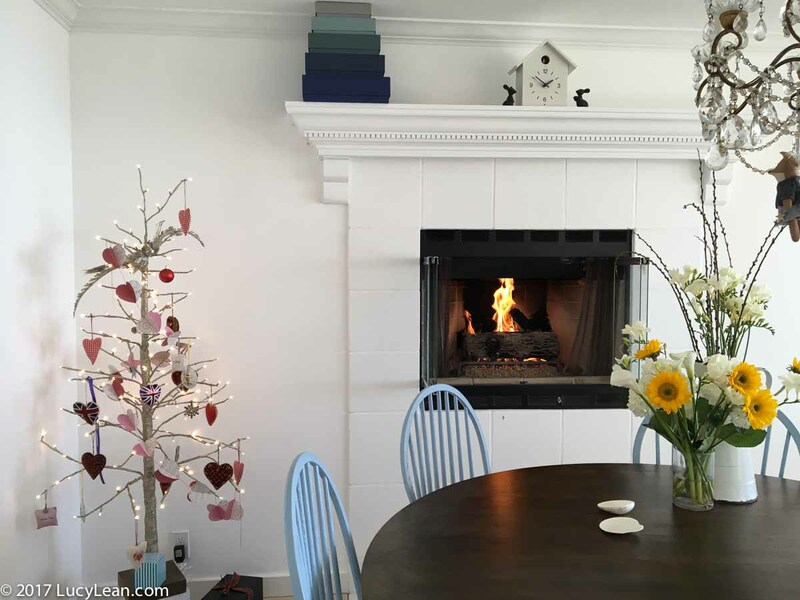 But this weekend it was time to re-decorate – Valentines has come and gone and we are now into March and Spring has sprung. The buckets at Trader Joes of bright sunny yellow daffodils make me think of Wordsworth and his host of golden daffodils, and at this time of year I’m always reminded of the poem of Robert Browning as the spring flowers begin to blossom. – Far brighter than this gaudy melon-flower! So my Spring tree is inspired by this beautiful poetry – oh to have the birdsong, the buttercups and the blossoms and dewdrops. 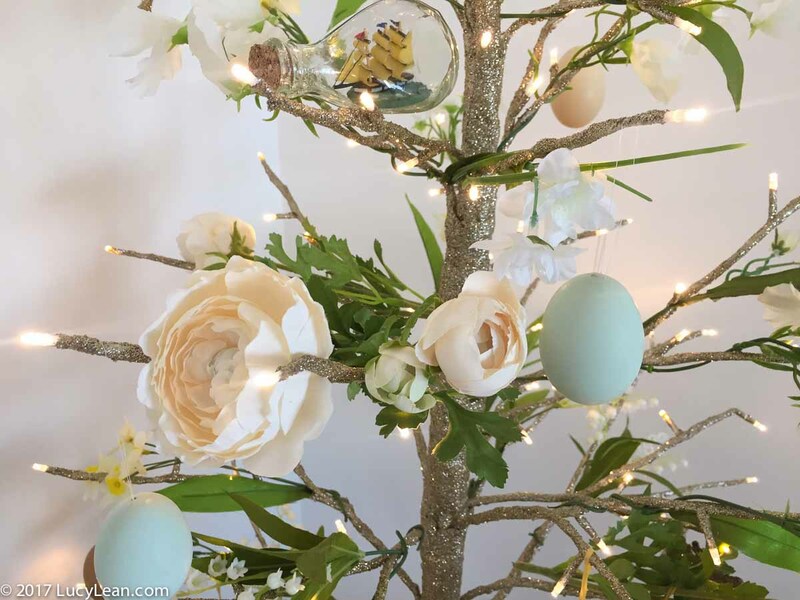 A selection of silk flowers – sweet peas, lily of the valley, daffodils – blossoms of pale yellows and white with a touch of green to adorn my tree. The silver love birds still sit on the top branches – I imagine theirs is the chaffinch song. Last weekend for brunch I got out a hammer and a little nail and made holes at each of the ends of the pale blue, green and white eggs from Vintage Grocers at Trancas Market and blew out the contents for the scrambled eggs. Having washed the shells well I dried them out and today attached a loop of cotton thread with glue to the thinner end of each egg and after letting the glue dry completely I hung the eggs on the tree. 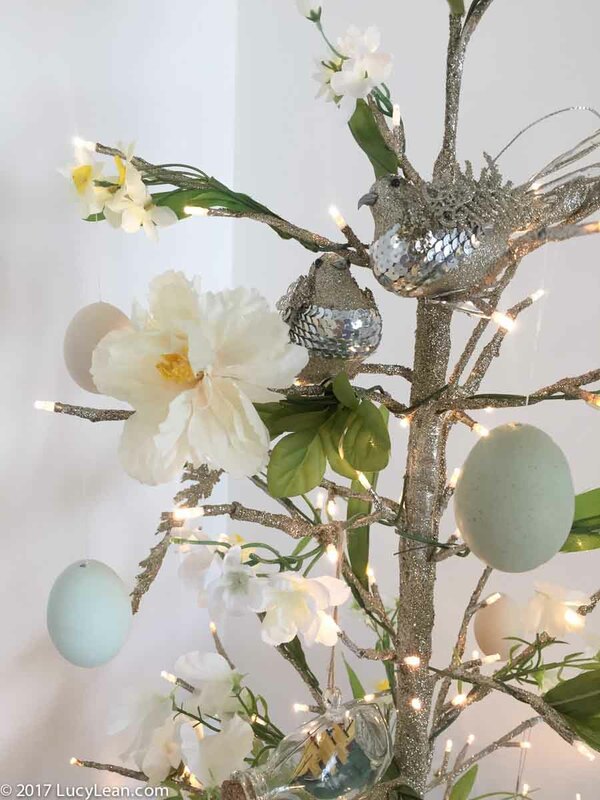 Next up I’m going to blow a few quails eggs and cover them with beads or fill them with chocolate and add them to Spring tree just in time for Easter. 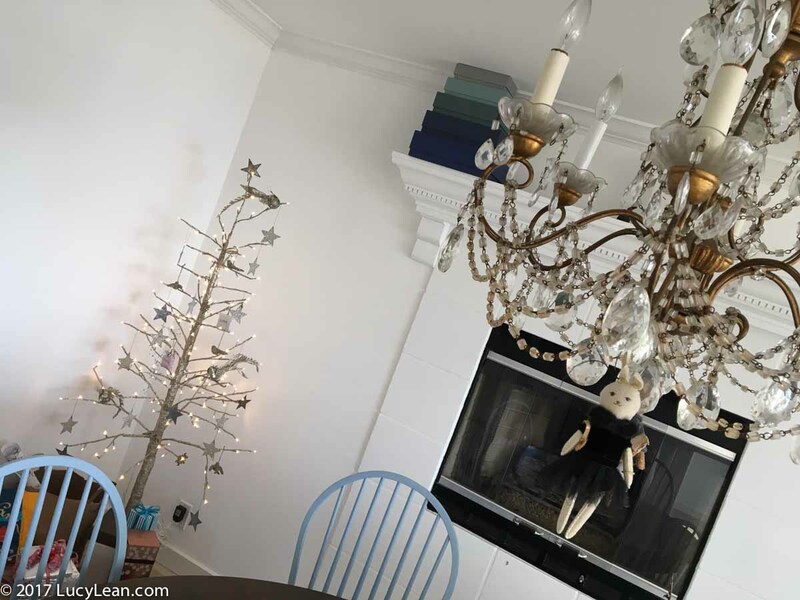 Some of the decorations carry over from one holiday to the next – for me a ship in a bottle could be used at anytime of year and so far it’s been up in all three renditions as I navigate this year of discovery and adventure. And as my basket seen below reminds me – despite everything Life is Beautiful. 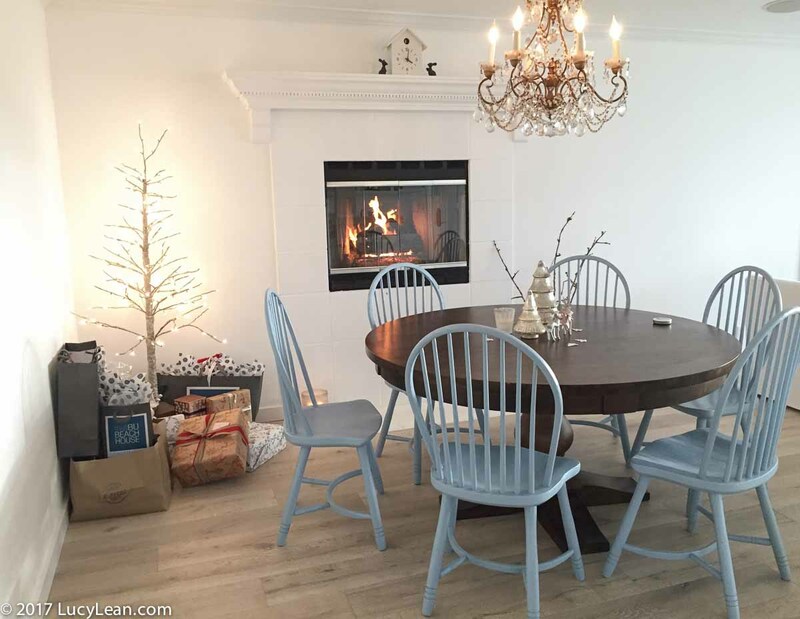 I’m so enjoying having a tree for all seasons – a new tradition is born. 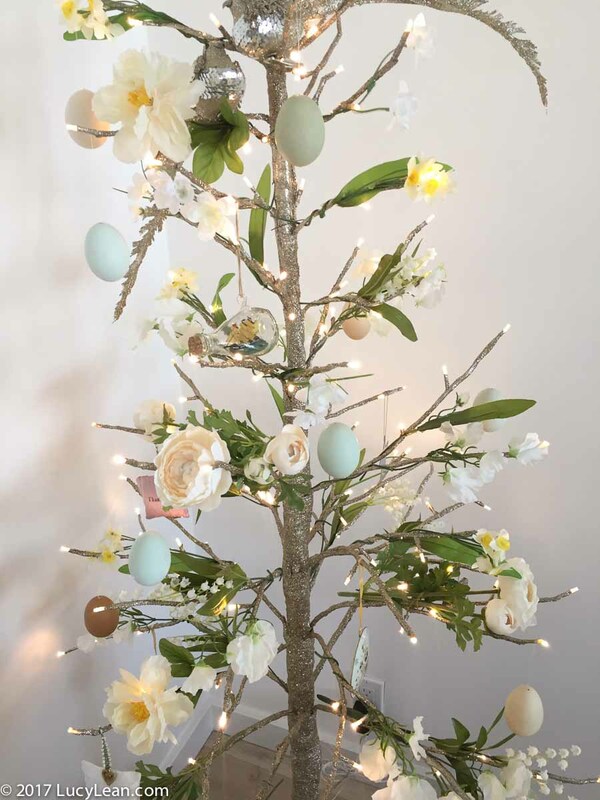 I see Spring tree carrying me through Easter and April – what should I have as my theme after that? Holidays coming up in May – Star Wars Day, Cinco de Mayo, Mother’s Day, Memorial Day… oh the fun we are going to have… then there’s July 4th, summer holidays, travel around Europe, Halloween and Thanksgiving… I can’t decide which is my favorite tree – it’s rather like asking me to decide to pick a favorite child. Which is your favorite tree so far?